Color-shaded topographic relief map of the Yellowstone Plateau-Snake River Plain volcanic province showing the track of the Yellowstone hot spot. 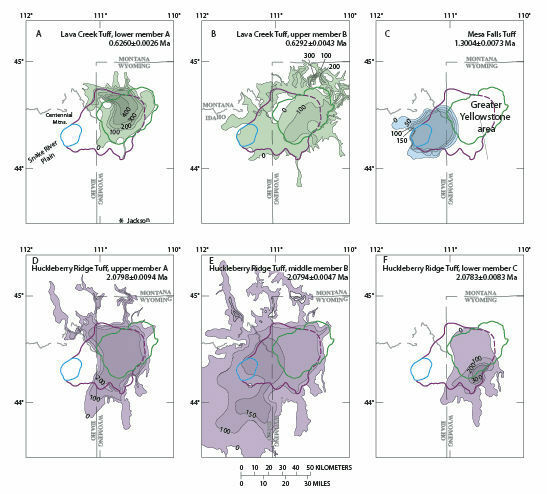 Map panels showing the distribution of major caldera-forming ash-flow deposits from the three major caldera-forming eruptions on the Yellowstone Plateau Volcanic Field. Maps displaying the stages of evolution of the more recent cycle of volcanism associated with Yellowstone Caldera. Many first-time visitors to Yellowstone National Park have heard about a "supervolcano" but, expecting a Rainier-like volcanic peak, often wonder "Where is the volcano?" In fact, they are in the middle of one of the Earth's largest volcanic structures, despite the relatively muted topography of the calderas and the volcanic deposits. The active tectonic and volcanic features in Yellowstone are the result of large-scale processes that have been occurring along the Snake River Plain for the past 17 million years and now are focused under the Yellowstone Plateau. 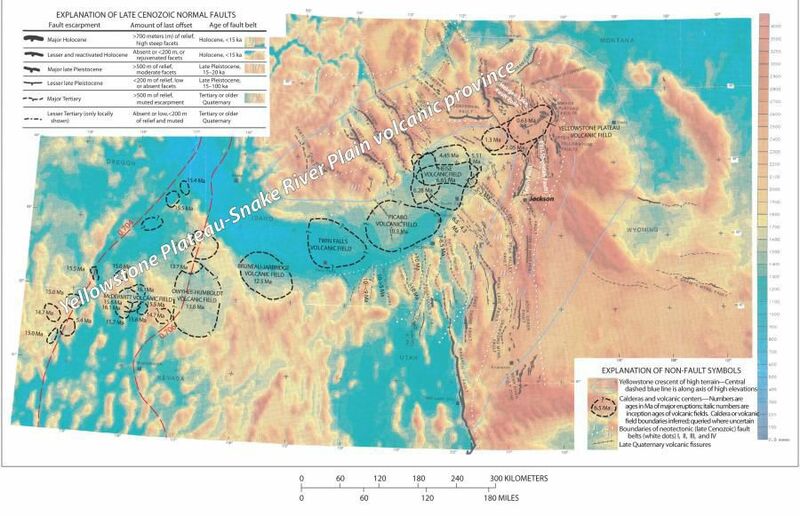 The Yellowstone Plateau Volcanic Field (YPVF) is the youngest of many in a 700-kilometer-long line of volcanic fields that started in northern Nevada and southern Oregon and have progressed northeast across the Snake River Plain. Each of these volcanic fields lasts 2 to 2.5 million years and results in multiple nested calderas. As the North American plate has moved about 2.7 centimeters a year over a deep-seated mantle plume, older versions of the YPVF were born, evolved, and eventually died. The current YPVF has seen three cataclysmic caldera-forming eruptions, starting with the first at around 2.08 million years ago. That eruption produced multiple ash sheets originating from at least three separate volcanic vents located within the Huckleberry Ridge Caldera, a structure that is close to 100 kilometers across. The second big eruption, the Henrys Fork Caldera, was considerably smaller, occurred about 1.3 million years ago, and was nested within the southwest portion of the older Huckleberry Ridge Caldera. The final caldera eruption, 631,000 years ago, created the Yellowstone Caldera and occurred from at least two separate volcanic vents. Much of our knowledge of the YPVF is based on the extensive exposures, detailed geologic mapping, and in-depth studies of the most recent caldera, but all three caldera forming events produced similar geologic features. In the case of the Yellowstone Caldera the first eruptions were a series of basalt and rhyolite lava flows that began about 1.2 million years ago. The actual caldera eruption itself occurred as two separate eruptive events separated by a very short time period (perhaps just days or weeks). The collapse of the caldera occurred just after these eruptions. After the caldera formed, volcanic eruptions — mostly rhyolite lava flows — continued in two major phases. The first phase began right after formation of the caldera and included activity associated with the Mallard Lake and the Sour Creek resurgent domes, which are located near the sources of the two caldera vents. These eruptions lasted until about 450,000 years ago. Following a long period of quiescence, renewed volcanism began about 250,000 years ago and continued intermittently until the most recent lava flow in Yellowstone about 70,000 years ago. The post-caldera lava flows represent some of the largest rhyolite flows on Earth, many in excess of several tens of cubic kilometers in volume, extending up to 30 kilometers from their source vents, and having thicknesses greater than 100 meters. The current stage of volcanism in Yellowstone is characterized by abundant hydrothermal activity, which began at least 400,000 years ago (but was probably occurring before that time as well). Glaciation also has played a major role in shaping the landscape — the Yellowstone area was home to the largest alpine glacial icecap in the western United States, with several major ice advances between 15,000 and 160,000 years ago. Since the last ice age about 15,000 years ago, more than 25 significant (more than 100 meters in diameter) hydrothermal explosion craters have formed within and on the perimeter of the Yellowstone Caldera and along the tectonically active Norris-Mammoth corridor. Due to their frequency (every 200-700 years) and potential level of local impact, large hydrothermal explosions pose one of the most significant hazards to humans and infrastructure in Yellowstone. While the exact future of the YPVF is not known, we do know from the track of the Yellowstone hot spot that at some time caldera-forming events will cease, the North American plate will continue to move southwestward over the relatively fixed thermal plume causing activity today at Yellowstone, and the elevation of current-day Yellowstone will subside substantially (up to 0.5-1 kilometer). Like we see today in the Snake River Plain, the YPVF eventually will be covered with a 0.5-1 kilometer-thick veneer of basalt lava.